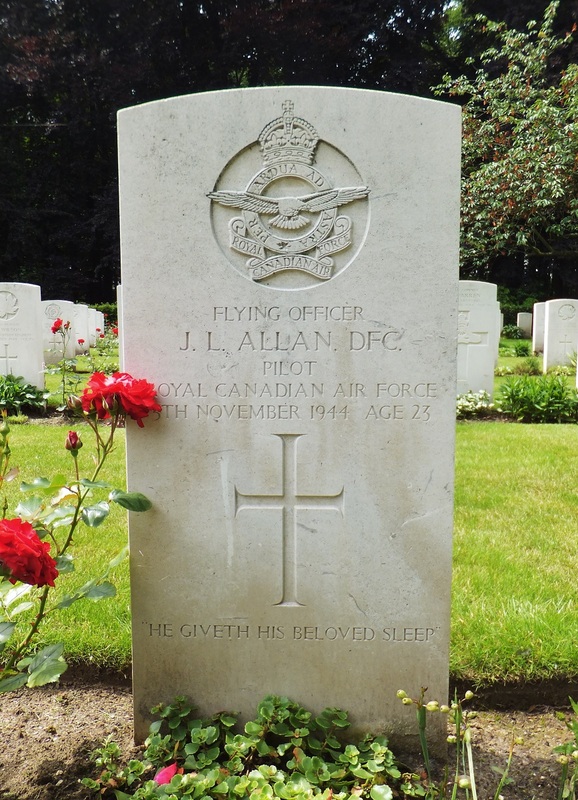 Crew F/O James Llewellyn Allan RCAF J/19586. Brief description of the crash The pilots of B-Flight were on call at an early hour this morning! Two sections of four aircraft were to take off together to attack gun positions at 172307 which was east of Flushing and slihgtly south of Veere. The eight Typhoons were lead by F/L Kirsch and took off at 0850 to attack the targets but no definite results were seen. Considerable light and accurate Flak came from around Veere but none of our aircraft were hit. F/O Allenâ€™s section was met with much light and accurate Flak from all around the target area. During the first attack F/O Allen was seen to be hit whilst diving on the target. Black smoke be-gan pouring from his engine and he immediately turned and flew towards Zuid-Beveland which is held by our own troops. James Allan heeft zijn opleiding gedaan te Camp Borden en volgde course 58 van 20 jun 1942 tot 9 oktober 1942. Een foto van de groep 58 die deelnam incl Allan heb ik toegevoegd.